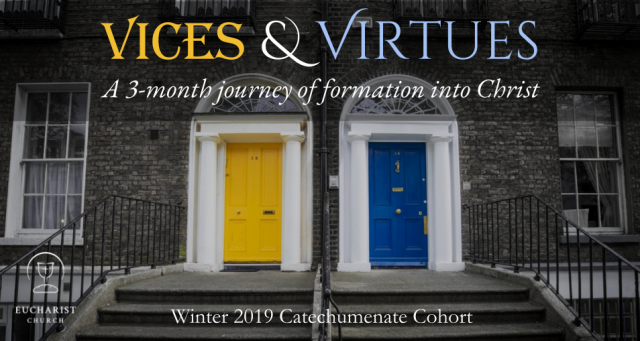 This module of the Catechumenate is a three-month communal journey of formation into Christ. Imagine it as a kind of “discipleship intensive”, a “bootcamp” for Christoformity. The Winter 2019 Cohort begins in mid-January and ends in mid-April (Holy Week). It is open to anyone interested in learning to live all of life in reference to Christ. To participate you must apply no later than December 16 and be able to attend the Catechumenate Retreat in January as well as the half-day retreat to end the cohort in April (Saturday, April 13th). The Catechumenate has a limit of 10 people. Priority is given based on application date (i.e apply now!). In this cohort module, our focus will be cultivating virtue and addressing the patterns of sin that inhibit our life in Christ (vices). Historically, the Church has emphasized 7 virtues (three theological virtues – faith, hope, love; four capital virtues – prudence, temperance, justice, courage) and 7 capital sins (envy, vainglory, sloth, avarice, anger, gluttony, lust). We will be exploring these one week at a time from a practice-based approach. We are committed to growing in virtue, not merely talking about virtue. Note that this is the only out of pocket cost for doing the Catechumenate. Installment payment plans are possible and/or scholarships can be made available upon request. We don’t want to exclude anyone from participation due to cost. Eucharist Church is a congregation in San Francisco connecting ancient forms of worship and classic Christian faith to the lives of 21st-century people.